This article appeared in symmetry on Oct. 7, 2015. Finding a small discrepancy in measurements of the properties of neutrinos could show us how they fit into the bigger picture. Physics, perhaps more so than any other science, relies on measuring the same thing in multiple ways. Different experiments let scientists narrow in on right answers that satisfy all parties—a scientific system of checks and balances. That’s why it’s exciting when a difference, even a minute one, appears. It can teach physicists something about their current model – or physics that extends beyond it. It’s possible that just such a discrepancy exists between a certain measurement of neutrinos coming out of accelerator experiments and reactor-based experiments. Neutrinos are minuscule, neutral particles that don’t interact with much of anything. They can happily pass through a light-year of lead without a peep. Trillions pass through you every second. In fact, they are the most abundant massive particle in the universe—and something scientists are, naturally, quite keen to understand. The ghostly particles come in three flavors: electron, muon and tau. They transition between these three flavors as they travel. This means that a muon neutrino leaving an accelerator at Fermi National Accelerator Laboratory in Illinois can show up as an electron neutrino in an underground detector in South Dakota. Not complicated enough for you? These neutrino flavors are made of mixtures of three different “mass states” of neutrinos, masses 1, 2 and 3. At the end of the day, neutrinos are weird. They hang out in the quantum realm, a land of probabilities and mixing matrices and other shenanigans. But here’s what you should know. There are lots of different things we can measure about neutrinos—and one of them is a parameter called theta13 (pronounced theta one three). Theta13 relates deeply to how neutrinos mix together, and it’s here that scientists have seen the faintest hint of disagreement from different experiments. There are lots of different ways to learn about neutrinos and things like theta13. Two of the most popular involve particle accelerators and nuclear reactors. The best measurements of theta13 come from nuclear reactor experiments such as Double Chooz, RENO and Daya Bay Reactor Neutrino Experiment based in China (which released the best measurement to date a few weeks ago). Detectors located near nuclear reactors provide such wonderful readings of theta13 because reactors produce an extremely pure fountain of electron antineutrinos, and theta13 is closely tied to how electron neutrinos mix. Researchers can calculate theta13 based on the number of electron antineutrinos that disappear as they travel from a near detector to the far detector, transforming into other types. Accelerators, on the other hand, typically start with a beam of muon neutrinos. And while that beam is fairly pure, it can have a bit of contamination in the form of electron neutrinos. Far detectors can look for both muon neutrinos that have disappeared and electron neutrinos that have appeared, but that variety comes with a price. 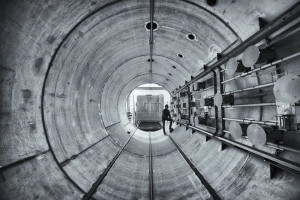 “Both the power and the curse of long-baseline neutrino oscillation is that it’s sensitive to all of neutrino oscillation, not just theta13,” says Dan Dwyer, a scientist at Lawrence Berkeley National Laboratory and researcher on Daya Bay. With that in mind, we come to the source of the disagreement. The results coming out of accelerator-based experiments, such as the United States-based NOvA and Japan-based T2K, see just a few more electron neutrinos than researchers would predict based on what the reactor experiments are saying. Data coming out of the accelerator experiments is still very young compared to the strong readings from reactor experiments, and it is complicated by the nature of the beam. No one is jumping on the discrepancy yet because it can be explained in different ways. Most importantly, the accelerator experiments just don’t have enough information. “We have to wait for T2K and NOvA to get sufficient statistics, and that’s going to take a while,” says Stephen Parke, head of the Theoretical Physics Department at Fermilab. Parke, Scholberg and Dwyer all estimated that about five more years of data collection will be required before researchers are able to start saying anything substantial. If the accelerator experiments gather more data and if a clear discrepancy emerges—a big if—what does it mean? Turns out there are lots of reasons to love theta13. It’s one of the fundamental parameters that can define our universe. From a practical standpoint, it helps design future experiments to better understand neutrinos. And it could help physicists learn something new. That something could be CP violation, evidence that neutrinos and antineutrinos behave differently. CP violation has never been seen in neutrinos before, but if researchers observed it with accelerator experiments, it could help explain why our universe is made of matter rather than equal parts of matter and antimatter. Figuring out if CP violation is occurring means nailing down all of the different neutrino mixing parameters, which in turn means building more powerful, next-generation experiments such as Hyper-K in Japan, JUNO in China and the Deep Underground Neutrino Experiment in the United States. DUNE will build on oscillation experiments like NOvA but will be able to better separate background noise from neutrino events, see a broader energy spectrum of neutrinos and find other neutrino characteristics. DUNE, which will be built in a repurposed gold mine in South Dakota and detect neutrinos passed 800 miles through the Earth from Fermilab in Illinois, will be one of the best ways to see CP violation and rely on expertise gained from smaller neutrino experiments. Ultimately, the neutrino puzzle is still missing many pieces. A variety of experiments are ramping up to fill in the gaps, making it an exciting time to be a neutrino physicist. On May 31, about 50 miles from the Canadian border, an electric car struggled up steep hills, driving along at 40 miles per hour. The sun was coming up and rain was coming down. Things were looking bleak. The car, which usually plotted the route to the nearest charging station, refused to give directions. Rewind to a few weeks earlier: Tom Rammer, a Chicago attorney, had just won two days with a Tesla at a silent cell phone auction for the American Cancer Society. He recruited Mike Kirby, a Fermilab physicist, to figure out how to get the most out of those 48 hours. Rammer and Kirby agreed that the answer was a road trip. Their initial plan was a one-way trip to New Orleans. Another involved driving to Phoenix and crossing the border to Mexico for a concert. Tesla politely vetoed these options. Ultimately, Rammer and Kirby decided on an 867-mile drive from Chicago to Boston. Their goal was to pick up Jayatilaka, a physicist working on the CMS experiment, and bring him back to Fermilab. To document their antics, the group hired a film crew of six to follow them on their wild voyage from the Windy City to Beantown. Jayatilaka joked that he didn’t trust Rammer and Kirby to arrange the trip on their own, so they also drafted Jen Raaf, a Fermilab physicist on the MicroBooNE experiment, whose organizational skills would balance their otherwise chaotic approach. “There was no preparing. Every time I brought it up Tom said, ‘Eh, it’ll get done,’” Raaf laughed. Jayatilaka added that shortly after Raaf came on board they started seeing spreadsheets sent around and itineraries being put together. “I had also made contingency plans in case we couldn’t make it to Boston,” Raaf said, with a hint of foreshadowing. 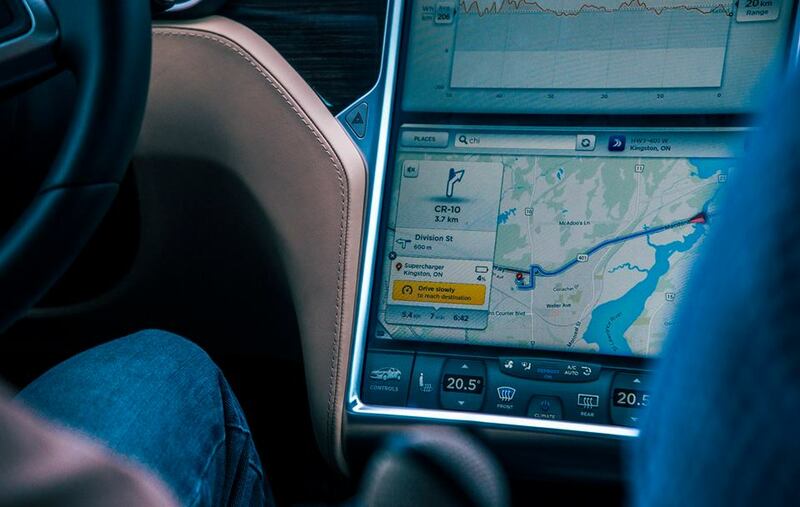 On May 29, Rammer, Kirby and Raaf picked up the Tesla and embarked on their journey. The car’s name was Barbara. She was a black Model S P85D, top of the line, and she could go from zero to 60 in 3.2 seconds. The trip started out on flat terrain, making for smooth, easy driving. But eventually the group hit mountains, which ate up Barbara’s battery capacity. In the spirit of science, these physicists pushed the boundaries of what they knew, testing Barbara’s limits as they braved undulating roads, encounters with speed-hungry Porsches and Canadian border patrol. The result of the experiment was that Barbara didn’t make it all the way to Boston. As they approached the east coast, it became clear to Kirby and Raaf that they wouldn’t have made it back in time to drop off the car. Although Rammer was determined to see the trip through to the end, he eventually gave in somewhere in New Jersey, and they decided to cut the trip short. Jayatilaka met the group in a parking lot in Springfield, Massachusetts, and they plotted the quickest route back to Chicago. Flash forward to that bleak moment on May 31. After crossing the border, just as things were looking hopeless, Barbara’s systems suddenly came back to life. She directed the group to a charging station in chilly Kingston, Ontario. Around 6:30 in the morning, they rolled into the station. The battery level: zero percent. After a long charge and another full day of driving, they pulled into the Tesla dealership in Chicago around 8:55 p.m., minutes before their time with Barbara was up. This article appeared in Fermilab Today on Aug. 12, 2015. A school bus-sized detector packed with 170 tons of liquid argon has seen its first particle footprints. 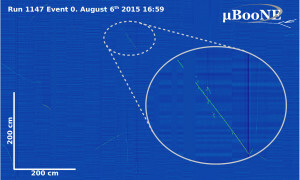 On Aug. 6, MicroBooNE, a liquid-argon time projection chamber, or LArTPC, recorded images of the tracks of cosmic muons, particles that shower down on Earth when cosmic rays collide with nuclei in our atmosphere. “This is the first detector of this size and scale we’ve ever launched in the U.S. for use in a neutrino beam, so it’s a very important milestone for the future of neutrino physics,” said Sam Zeller, co-spokesperson for the MicroBooNE collaboration. Picking up cosmic muons is just one brief stop during MicroBooNE’s expedition into particle physics. The centerpiece of the three detectors planned for Fermilab’s Short-Baseline Neutrino program, or SBN, MicroBooNE will pursue the much more elusive neutrino, taking data about this weakly interacting particle for about three years. When beam starts up in October, it will travel 470 meters and then traverse the liquid argon in MicroBooNE, where neutrino interactions will result in tracks that the detector can convert into precise three-dimensional images. Scientists will use these images to investigate anomalies seen in an earlier experiment called MiniBooNE, with the aim to determine whether the excess of low-energy events that MiniBooNE saw was due to a new source of background photons or if there could be additional types of neutrinos beyond the three established flavors. One of MicroBooNE’s goals is to measure how often a neutrino that interacts with an argon atom will produce certain types of particles. A second goal is to conduct R&D for future large-scale LArTPCs. MicroBooNE will carry signals up to two and a half meters across the detector, the longest drift ever for a LArTPC in a neutrino beam. This requires a very high voltage and very pure liquid argon. 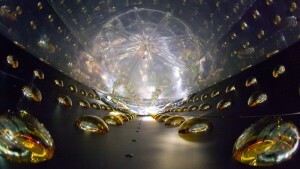 It is also the first time a detector will operate with its electronics submerged in liquid argon on such a large scale. All of these characteristics will be important for future experiments such as the Deep Underground Neutrino Experiment, or DUNE, which plans to use similar technology to probe neutrinos. Another benefit of the experiment, Zeller said, is training the next generation of LArTPC experts for future programs and experiments. MicroBooNE is a collaborative effort of 25 institutions, with 55 students and postdocs working tirelessly to perfect the technology. Collaborators are keeping their eyes on the road toward the future of neutrino physics and liquid-argon technology. This article appeared in Fermilab Today on Aug. 11, 2015. If you’ve ever looked at a graphic of Fermilab’s future Mu2e experiment, you’ve likely noticed its distinctive, center s-shaped section. Tall and wide enough for a person to fit inside it, this large, curving series of magnets, called the transport solenoid, is perhaps the experiment’s most technologically demanding piece to build. 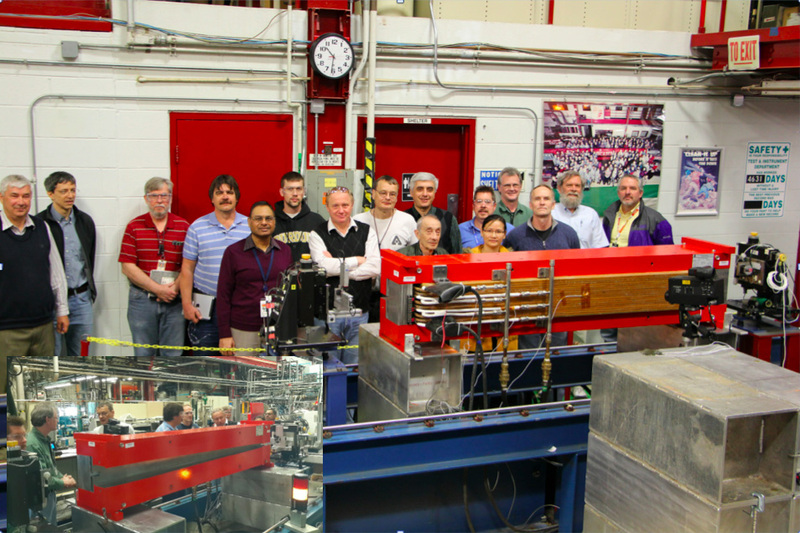 Last month a group in the Fermilab Technical Division aced three tests — for alignment, current and temperature — of a prototype transport solenoid module built by magnet experts at Fermilab’s Technical Division and INFN-Genoa in Italy. The triple milestone means that Fermilab can now order the full set for production — 27 modules. “The results were excellent,” said Magnet Systems Department scientist Mau Lopes, who is leading the effort. There’s not much wiggle room when it comes to the transport solenoid, a crucial component for the ultrasensitive Mu2e experiment. Mu2e will look for a predicted but never observed phenomenon, the conversion of a muon into its much lighter, more familiar cousin, the electron, without the usual accompanying neutrinos. To do this, it will send muons into a detector where scientists will look for particular signatures of the rare process. The transport solenoid generates a magnetic field that deftly separates muons based on their momentum and charge and directs slow muons to the center of the Mu2e detector. The maneuver requires some fairly precisely designed details, not the least of which is a good fit. When put together, the 27 wedge-shaped modules will form a tube with the snake-like profile. Muons will travel down this vacuum tube. To guide them along the right path to the detector, the solenoid units must align with each other to within 0.2 degrees. The Magnet Systems team exceeded expectation: The prototype was aligned with 100 times greater precision. The team achieved not just the right shape, but the right current. The electrical current running through the solenoid coil creates the magnetic field. The Mu2e team exceeded the nominal current of 1,730 amps, reaching 2,200 amps. As a bonus, while that amount of current has the potential to create a slight deformation in the module’s shape, the Mu2e team measured no change in the structure. Nor was there much change in the model’s temperature, which must be very low. The team delivered 2.5 watts of power to the coil — well above what the coils will see when running. The module proved robust: The temperature changed by a mere whisker — 150 millikelvin, or 0.27 degrees Fahrenheit. The coils will be at 5 Kelvin when operating. The prototype sustained the nominal current at up to 8 Kelvin. Fermilab has selected a vendor to produce the modules. Lopes expects that it will be two and a half years until all modules are complete. This article appeared in Fermilab Today on Aug. 10, 2015. In 1995, physicists working on the Liquid Scintillator Neutrino Detector, or LSND, at Los Alamos National Laboratory stumbled upon some curious results. The experiment, whose goal was to investigate oscillations between the three different flavors of the elusive neutrino, saw evidence that there might be at least one additional flavor of neutrino lurking just out of reach. In 2002, an experiment at Fermilab called MiniBooNE started collecting data to explore this anomaly, but the results were inconclusive: some data seemed to refute the possibility of a fourth neutrino, but other data seemed to indicate particle interactions that couldn’t be explained with conventional three-neutrino models. The possibility of a mysterious, fourth neutrino remained alive. Scientists from Fermilab and more than 45 institutions around the world have teamed up to design a program to catch this hypothetical neutrino in the act. The program, called the Short-Baseline Neutrino (SBN) program, makes use of a trio of detectors positioned along one of Fermilab’s neutrino beams. Although there are other reactor and source-based experiments in the world that actively seek a fourth neutrino, also called a sterile neutrino, SBN is the only program that uses a particle accelerator to produce neutrinos and multiple neutrino detectors for this search. Determining whether there are more than three neutrino flavors would affect how scientists interpret data from experiments like the planned Deep Underground Neutrino Experiment, which is expected to make transformative discoveries about neutrinos, and perhaps other aspects of the universe, in the future. Solving the mystery of the anomalies seen at LSND and MiniBooNE, however, will not be easy. Because the sterile neutrino would not interact through the weak nuclear force as the other three do (hence the name “sterile”), detecting this particle would be like chasing the shadow of a ghost. It begins at the Fermilab Booster, where protons are accelerated to 8 GeV and smashed into a target, creating new particles. Charged particles are bent forward by a magnetic focusing device into a tunnel where most decay to produce muon neutrinos. The three detectors — named the Short-Baseline Near Detector, or SBND, MicroBooNE and ICARUS — will be spread out over a distance of 600 meters. SBND, 100 meters from the target, will take data close to the source to reduce systematic uncertainties by measuring the initial characteristics of the muon neutrino beam. Four hundred meters beyond the planned site for SBND is MicroBooNE, which is already installed. ICARUS will be located 110 meters past MicroBooNE. ICARUS is an existing detector from a previous experiment at the Italian INFN laboratory at Gran Sasso that is currently being refurbished at CERN. It will have a massive chamber holding 760 tons of liquid argon to beat down statistical uncertainties in the experiment. 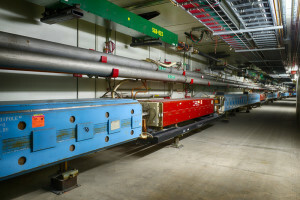 All three of the detectors are time projection chambers, a type of detector that allows physicists to analyze particle collisions in three dimensions. For these particular TPCs, scientists use liquid argon because its relatively heavy mass ensures a higher rate of interactions. MicroBooNE received its last fill of liquid argon in July and recently began taking data. Scientists are expecting to break ground on buildings for both ICARUS and SBND by this fall. In 2017, ICARUS will be fully refurbished and delivered to Fermilab. Scientists hope to complete building SBND that same year. Since experimenters won’t be able to directly detect the sterile neutrino, they will search for clues in the trails of particles the three known neutrino flavors leave behind in the liquid argon after they interact. If the experiments, expected to begin running in 2018, see deviations in the expected neutrino oscillation pattern, scientists will know that they’re on the right track in their hunt for this fugitive particle. If not, they will be able to put the mystery of the sterile neutrino to rest. 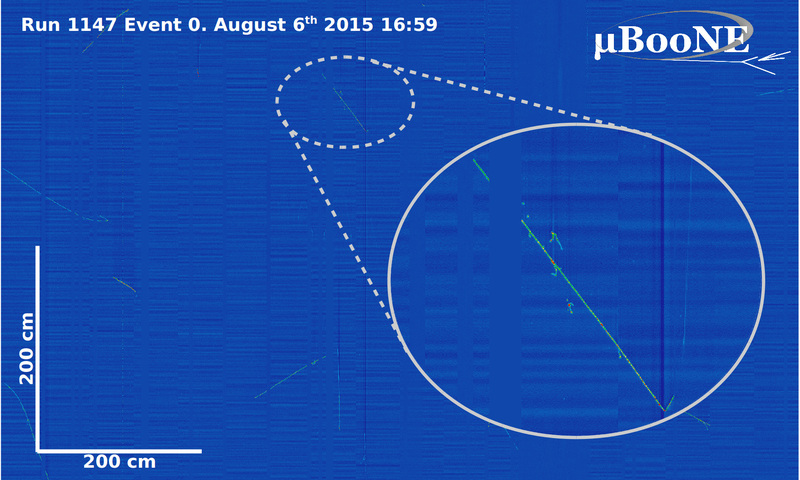 This article appeared in Fermilab Today on July 24, 2015. 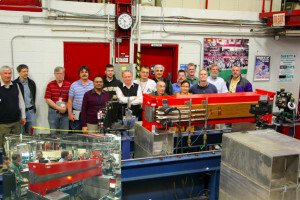 A magnet two meters long sits in the Experiment Assembly Area of the Advanced Photon Source at Argonne National Laboratory. The magnet, built by Fermilab’s Technical Division, is fire engine red and has on its back a copper coil that doesn’t quite reach from one end to the other. An opening on one end of the magnet’s steel casing gives it the appearance of a rectangular alligator with its mouth slightly ajar. The APS is a synchrotron light source that accelerates electrons nearly to the speed of light and then uses magnets to steer them around a circular storage ring the size of a major-league baseball stadium. As the electrons bend, they release energy in the form of synchrotron radiation — light that spans the energy range from visible to x-rays. This radiation can be used for a number of applications, such as microscopy and spectroscopy. In 2013, the federal Basic Energy Sciences Advisory Committee, which advises the Director of the Department of Energy’s Office of Science, recommended a more ambitious approach to upgrades of U.S. light sources. The APS Upgrade will create a world-leading facility by using new state-of-the-art magnets to tighten the focus of the APS electron beam and dramatically increase the brightness of its X-rays, expanding its experimental capabilities by orders of magnitude. 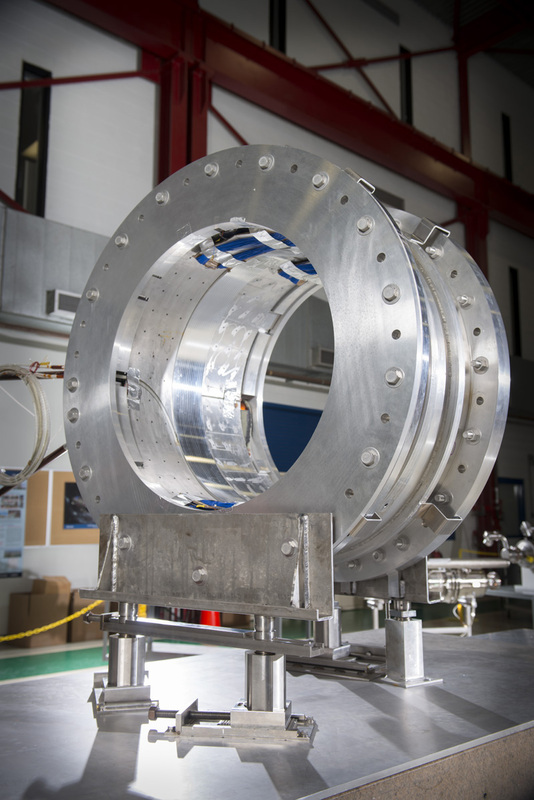 Instead of the APS’ present magnet configuration, which uses two bending magnets in each of 40 identical sectors, the upgraded ring will deploy seven bending magnets per sector to produce a brighter, highly focused beam. Because the APS Upgrade requires hundreds of magnets — many of them quite unusual — Argonne called on experts at Fermilab and Brookhaven National Laboratory for assistance in magnet design and development. Fermilab took on the task of designing, building and testing a pre-prototype for a groundbreaking M1 magnet — the first in the string of bending magnets that makes up the new APS arrangement. The M1’s magnetic field is strong at one end and tapers off at the other end, reducing the impact of processes that increase the beam size, producing a brighter beam. Because of this change in field, this magnet is different from anything Fermilab had ever built. But by May, Fermilab’s team had completed and tested the magnet and shipped it to Argonne, where it charged triumphantly through a series of tests. 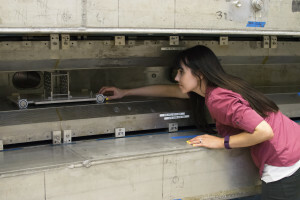 Although this pre-prototype magnet is unlikely to be installed in the complete storage ring, scientists working in this collaboration view the M1 development as an opportunity to learn about technical difficulties, validate their designs and strengthen their skills. This Fermilab press release came out on July 8, 2015. A key element in a particle-accelerator-based neutrino experiment is the power of the beam that gives birth to neutrinos: The more particles you can pack into that beam, the better your chance to see neutrinos interact in your detector. Today scientists announced that Fermilab has set a world record for the most powerful high-energy particle beam for neutrino experiments. Scientists, engineers and technicians at the U.S. Department of Energy’s Fermi National Accelerator Laboratory have achieved for high-energy neutrino experiments a world record: a sustained 521-kilowatt beam generated by the Main Injector particle accelerator. More than 1,000 physicists from around the world will use this high-intensity beam to more closely study neutrinos and fleeting particles called muons, both fundamental building blocks of our universe. The record beam power surpasses that of the 400-plus-kilowatt beam sent to neutrino experiments from particle accelerators at CERN. Setting this world record is an initial step for the Fermilab accelerator complex as it will gradually increase beam power over the coming years. The next goal for the laboratory’s two-mile-around Main Injector accelerator — the final and most powerful in Fermilab’s accelerator chain — is to deliver 700-kilowatt beams to the laboratory’s various experiments. Ultimately, Fermilab plans to make additional upgrades to its accelerator complex over the next decade, achieving beam power in excess of 1,000 kilowatts, also referred to as 1 megawatt. “We have the world’s highest-power beam for neutrinos, and we’re only going up from here,” said Ioanis Kourbanis, head of the Main Injector Department at Fermilab. Laboratory-made neutrino experiments start by accelerating a beam of particles, typically protons, and then smashing them into a target to create neutrinos. Scientists then use particle detectors to “catch” as many of those neutrinos as possible and record their interactions. Neutrinos rarely engage with matter: Only one out of every trillion emerging from the proton beam will interact in an experiment’s detector. The more particles in that beam, the more opportunities researchers will have to study these rare interactions. The amped-up particle beam provided by the Main Injector enriches the lab’s neutrino supply, positioning Fermilab to become the primary laboratory for accelerator-based neutrino research. Neutrinos are also made in stars and in the Earth’s core, and they pass through everything — people and planets alike. Fermilab currently operates four neutrino experiments: MicroBooNE, MINERvA, MINOS+ and the laboratory’s largest-to-date neutrino experiment, NOvA, which sends particles from Fermilab’s suburban Chicago location to a far detector 500 miles away in Ash River, Minnesota. The laboratory is working with scientists from around the world on expanding its short-baseline neutrino program and would also serve as host to the proposed flagship Long-Baseline Neutrino Facility and Deep Underground Neutrino Experiment, or DUNE. Scientists aim to address basic questions about the mass and properties of each kind of neutrino as well as the role neutrinos played in the evolution of the universe. Fermilab is also preparing to operate two experiments for studying muons, short-lived particles that could reveal secrets about the earliest moments of the universe. The increased beam power will also benefit the Fermilab Test Beam Facility, one of the few facilities in the world that provides muons, pions and other particles that researchers can use to test their particle detectors. Since 2011, Fermilab has made significant upgrades to its accelerators and reconfigured the complex to provide the best possible particle beams for neutrino and muon experiments. With the dedicated work of the Fermilab Accelerator Division, the Main Injector is on track to nearly double its Tevatron-era beam power by 2016. 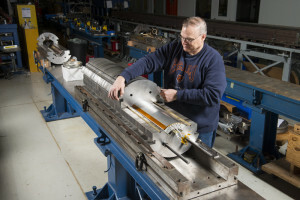 “Fermilab’s beamline has been a tremendous driver of neutrino science for many years, and the continued improvements to the intensity mean that it will remain a driver for many years to come,” said Indiana University’s Mark Messier, co-spokesperson for the NOvA experiment. Fermilab is America’s premier national laboratory for particle physics and accelerator research. A U.S. Department of Energy Office of Science laboratory, Fermilab is located near Chicago, Illinois, and operated under contract by the Fermi Research Alliance LLC. Visit Fermilab’s website at www.fnal.gov, and follow us on Twitter at @Fermilab. This article appeared in Fermilab Today on July 8, 2015. Bonnie Weiberg sits down in front of a small monitor in the Proton Assembly Building at Fermilab. Her job is to test the signal strength of the liquid-argon purification monitors for the proposed DUNE experiment. But Weiberg isn’t your average particle physicist. In fact she isn’t a physicist at all: She’s a physics and chemistry teacher at Niles North High School in Skokie, Illinois. Weiberg is here this summer as part of the Fermilab TRAC program, which is funded by the Particle Physics Division. Harry Cheung, an associate head for the CMS Department who has been head of the TRAC program since 2010, said that this year, seven teachers were selected from a pool of 33 applicants to be matched with a mentor and work on cutting-edge physics. The TRAC program gives middle school and high school teachers of science, math, computer science and engineering an opportunity to come to Fermilab, work with a scientist or an engineer for eight weeks, and experience what Fermilab research is like. This summer the teachers, most of whom are from Illinois, are working on projects such as building and testing photodetectors, reconstructing the Muon g-2 ring and controlling high-voltage supplies for the MINERvA neutrino experiment. Kerbie Reader, a high school math teacher at Forest Ridge School of the Sacred Heart in Bellevue, Washington, said that TRAC is the only program she could find in the country that enables teachers to participate in this sort of research. She appreciates the opportunity to remember what it’s like to be a student and to gain experience that will help her relate to her own students. Weiberg and Reader agreed that the most valuable aspect of this program is being able to gain real-life experiences that they can bring back to their schools and share with their students. Weiberg is even working on a unit about particle physics to incorporate into her curriculum. Reader added that the TRAC program gives her a chance to participate in difficult research: to be challenged and learn the value of getting things wrong. This article appeared in Fermilab Today on June 22, 2015. Last month, a group collaborating across four national laboratories completed the first successful tests of a superconducting coil in preparation for the future high-luminosity upgrade of the Large Hadron Collider, or HL-LHC. These tests indicate that the magnet design may be adequate for its intended use. Physicists, engineers and technicians of the U.S. LHC Accelerator Research Program (LARP) are working to produce the powerful magnets that will become part of the HL-LHC, scheduled to start up around 2025. The plan for this upgrade is to increase the particle collision rate, or luminosity, by approximately a factor of 10, so expanding the collider’s physics reach by creating 10 times more data. “The upgrade will help us get closer to new physics. If we see something with the current run, we’ll need more data to get a clear picture. If we don’t find anything, more data may help us to see something new,” said Technical Division’s Giorgio Ambrosio, leader of the LARP magnet effort. LARP is developing more advanced quadrupole magnets, which are used to focus particle beams. These magnets will have larger beam apertures and the ability to produce higher magnetic fields than those at the current LHC. The Department of Energy established LARP in 2003 to contribute to LHC commissioning and prepare for upgrades. LARP includes Brookhaven National Laboratory, Fermilab, Lawrence Berkeley National Laboratory and SLAC. Its members began developing the technology for advanced large-aperture quadrupole magnets around 2004. The superconducting magnets currently in use at the LHC are made from niobium titanium, which has proven to be a very effective material to date. However, they will not be able to support the higher magnetic fields and larger apertures the collider needs to achieve higher luminosities. To push these limits, LARP scientists and engineers turned to a different material, niobium tin. Niobium tin was discovered before niobium titanium. However, it has not yet been used in accelerators because, unlike niobium titanium, niobium tin is very brittle, making it susceptible to mechanical damage. To be used in high-energy accelerators, these magnets need to withstand large amounts of force, making them difficult to engineer. LARP worked on this challenge for almost 10 years and went through a number of model magnets before it successfully started the fabrication of coils for 150-millimeter-aperture quadrupoles. Four coils are required for each quadrupole. LARP and CERN collaborated closely on the design of the coils. After the first coil was built in the United States earlier this year, the LARP team successfully tested it in a magnetic mirror structure. The mirror structure makes possible tests of individual coils under magnetic field conditions similar to those of a quadrupole magnet. At 1.9 Kelvin, the coil exceeded 19 kiloamps, 15 percent above the operating current. The team also demonstrated that the coil was protected from the stresses and heat generated during a quench, the rapid transition from superconducting to normal state. 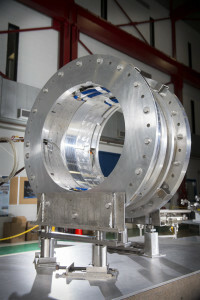 Over the next few months, LARP members plan to test the completed quadrupole magnet. This article appeared in Fermilab Today on May 27, 2015. Dark energy makes up about 70 percent of the universe and is causing its accelerating expansion. But what it is or how it works remains a mystery. The Dark Energy Spectroscopic Instrument (DESI) will study the origins and effects of dark energy by creating the largest 3-D map of the universe to date. It will produce a map of the northern sky that will span 11 billion light-years and measure around 25 million galaxies and quasars, extending back to when the universe was a mere 3 billion years old. 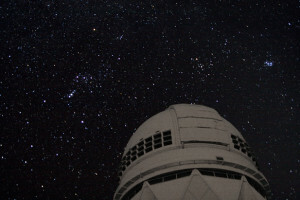 Once construction is complete, DESI will sit atop the Mayall 4-Meter Telescope in Arizona and take data for five years. DESI will work by collecting light using optical fibers that look through the instrument’s lenses and can be wiggled around to point precisely at galaxies. With 5,000 fibers, it can collect light from 5,000 galaxies at a time. These fibers will pass the galaxy light to a spectrograph, and researchers will use this information to precisely determine each galaxy’s three-dimensional position in the universe. Lawrence Berkeley National Laboratory is managing the DESI experiment, and Fermilab is making four main contributions: building the instrument’s barrel, packaging and testing charge-coupled devices, or CCDs, developing an online database and building the software that will tell the fibers exactly where to point. The barrel is a structure that will hold DESI’s six lenses. Once complete, it will be around 2.5 meters tall and a meter wide, about the size of a telephone booth. Fermilab is assembling both the barrel and the structures that will hold it on the telescope. DESI’s spectrograph will use CCDs, sensors that work by converting light collected from distant galaxies into electrons, then to digital values for analysis. Fermilab is responsible for packaging and testing these CCDs before they can be assembled into the spectrograph. Fermilab is also creating a database that will store information required to operate DESI’s online systems, which direct the position of the telescope, control and read the CCDs, and ensure proper functioning of the spectrograph. Lastly, Fermilab is developing the software that will convert the known positions of interesting galaxies and quasars to coordinates for the fiber positioning system. Fermilab completed these same tasks when it built the Dark Energy Camera (DECam), an instrument that currently sits on the Victor Blanco Telescope in Chile, imaging the universe. Many of these scientists and engineers are bringing this expertise to DESI. “DESI is the next step. DECam is going to precisely measure the sky in 2-D, and getting to the third dimension is a natural progression,” said Fermilab’s Brenna Flaugher, project manager for DECam and one of the leading scientists on DESI. 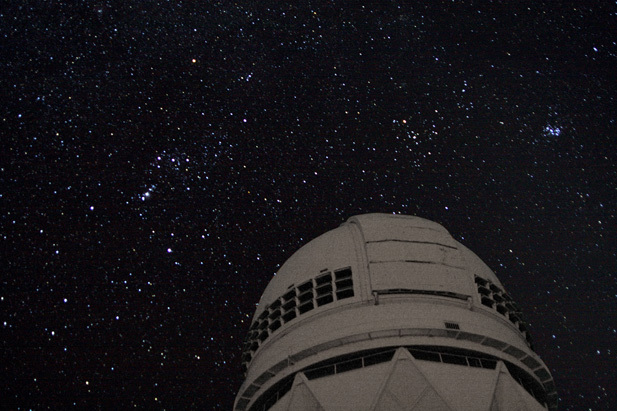 These four contributions are set to be completed by 2018, and DESI is expected to see first light in 2019. “This is a great opportunity for students to learn the technology and participate in a nice instrumentation project,” said Juan Estrada, a Fermilab scientist leading the DESI CCD effort. DESI is funded largely by the Department of Energy with significant contributions from non-U.S. and private funding sources. It is currently undergoing the DOE CD-2 review and approval process. “We’re really appreciative of the strong technical and scientific support from Fermilab,” said Berkeley Lab’s Michael Levi, DESI project director.